The Compact Weaver Pachyphantes superciliosus is in a monotypic genus (only one species in the genus), namely Pachyphantes, this name meaning "thick, weaver", referring to its heavy bill. The bird is stocky and short-tailed, with a heavy bill. 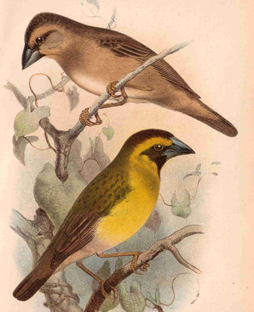 The male has a yellow crown and its dark green upperparts distinguish it from other 'masked' weavers. The female is similar but the top of the head is dark, separated from the mask by a broad yellow stripe. Non-breeding adults are brownish. A dull coloured female moulting into bright plumage is unique in the Ploceidae family. The painting (left) shows the first illustration for the species, with a young bird or non-breeding adult above a female in breeding plumage (from Sharpe RB 1890. Catalogue of the Passeriformes, or perching birds, in the collection of the British Museum. Vol. 13.). The Compact Weaver occurs singly, in pairs, or in small groups. It feeds on grass seeds and arthropods. It is found in grassland or grassy savanna while breeding, and more wooded areas the rest of the year. The Compact Weaver has no subspecies. Its position in the weaver family is uncertain but appears to be most closely related to the Thick-billed Weaver. The Compact Weaver is found in widely disjoint populations across West Africa as far east as Ethiopia and western Kenya, and south to northern Angola (with one record from Zambia). The Compact Weaver is monogamous. Its nest is distinctive, with a side entrance, being similar to that of the Thick-billed Weaver. 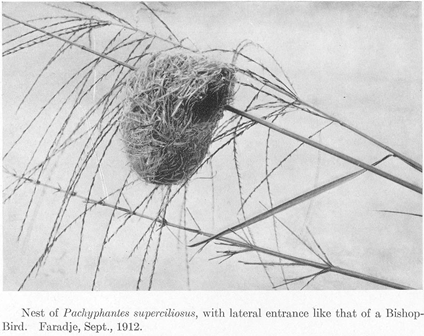 The nest is attached to tall grass stems. This species is not generally colonial and pairs occupy a territory with one nest, but sometimes the male builds a second roosting nest nearby. The male probably narrows the entrance of breeding nests but little has been published about nest building in this species. There are no PHOWN records for this species as yet. Please look out for nests of this species, and other weaver species, and submit to PHOWN (PHOtos of Weaver Nests) via the Virtual Museum upload site. PHOWN records for the Compact Weaver will appear here where there is already a species summary with information on eggs and breeding seasons. Photo: probably the first illustration of the nest of this species, from Chapin JP. 1917. The classification of the weaverbirds. Bulletin of the American Museum of Natural History 37:243-280.